I’d like to shine the spotlight on an advertisement that is, well… shining the spotlight on a musician, for lack of a better term. Here’s a La Bella Strings clipping from the December 1981 issue of Musician magazine featuring bassist Jamaaladeen Tacuma. There’s a certain level of charm to this advertisement that I find lacking in some. I realize that there are blatant references to the string manufacturer all over the final paragraph, but I appreciate the extensive references to where his playing can be heard (some of which I’m still guilty of not investigating), as well as some opinions about the current music scene. It’s like getting a bonus mini-article in an unexpected place, a great example of an information-based ad that I don’t see much of anymore. My introduction to Jamaaladeen happened to take the form of the exact photo of him above. 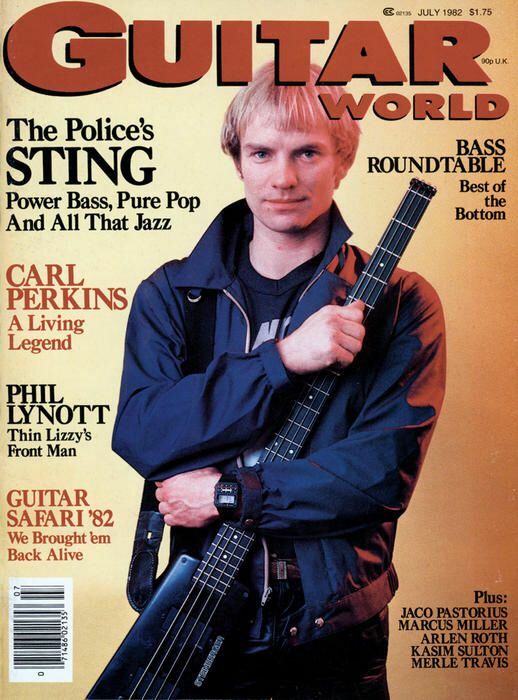 Not in the context of the La Bella spread, but in a Guitar World issue from July 1982 that featured a bassist roundtable. 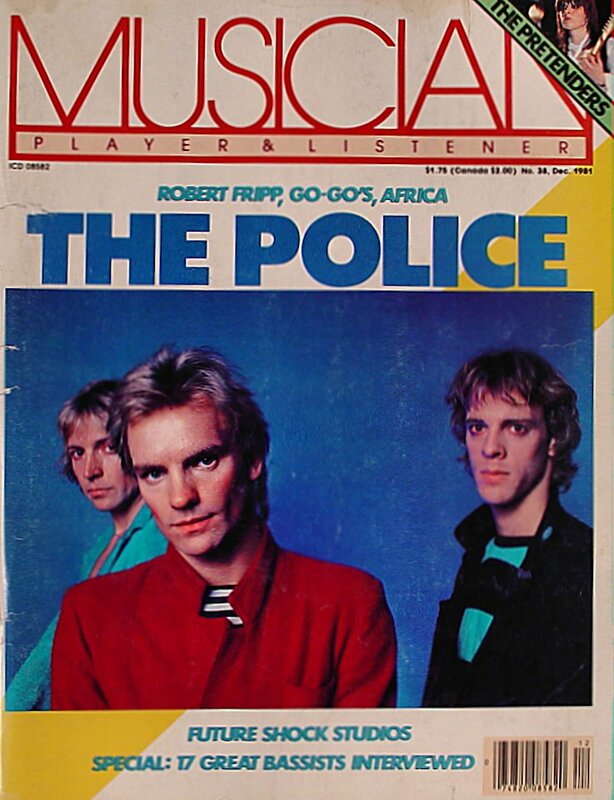 The much-more notorious Sting graced that issues cover (The Police, coincidentally, are on the cover of the Musician issue containing the above ad), but the article itself was very enlightening, sharing the opinions of a collective which also included Tony Levin, Alphonso Johnson, and Bob Cranshaw among them. The discussion was formatted in a similar manner to the ad that I’m sharing, further sparking the sense of deja vu that it gave me. He’s one of those musicians that I wrote on a giant list of those I hoped to see live, but wasn’t even certain if it would be a possibility since I’m not very aware of his touring habits. Fortunately, I did catch Tacuma late last year playing at the Remix Lounge late last year playing with Kahil El’Zabar’s Ritual Trio (with Teodross Avery on saxophone rounding out the lineup). Kahil El’Zabar would be worth writing a post about all on his own, as I’ve caught him three times already with various musicians in the past few years when he has played in Toronto. I decided to bring a record of his with me to the show to get signed. The album I selected, Show Stopper, was an apt description for his performance with the trio. Tacuma brought a strong energy and groove to the group in addition to the high technicality level evident in his soloing, holding his own up there with some other great bass soloists I’ve seen live (Stanley Clarke and John Patitucci also standing out in my mind). His wife took a picture of my brother and I posing with Jamaaladeen holding the freshly-autographed albums we brought with us (Jukebox being the other album). It may be worth tracking her down to see if she still has a copy of the picture. For now, this picture will have to do. And for those curious, he still dresses as sharply as he does on those album covers. La Bella was not simply highlighting a flash-in-the-pan musician to make an easy buck off a big name. That advertisement’s “Musicians of Note” message has as much relevance now as it did 37 years ago. To bassists looking to find another influence or any music fan looking to branch out into jazz, follow La Bella’s advice and check out Jamaaladeen Tacuma.